Situated on the A595, the small village of Kirkby In Furness sits nearly eight miles North West of Ulverston, looking out over Duddon Sands. The hall shown below, is sited to the North of the village, next to the old railway. The hall seems to have been the subject of much debate regarding its defensive credentials....with some historians hinting that there may have been an earlier building on the site, possibly a pele tower or other defensive tower, or that the existing hall and its buildings, contain the remains of a pele tower or other defensive tower. The building seems to contain the remains of two halls. The first hall contains a newel in the South Eastern corner, possibly indicating that there was a tower here....possibly the remains of our original pele tower. The second hall, to the East of the building, contains a very thick North Western wall, also possibly the remains of an earlier, defensive (?) tower. The East wing dates from about 1450, whilst the West wing dates from around 1530. The photo above, shows the South Eastern face of the hall. The newel lays beneath the middle of the three largest chimneys, and is probably the oldest part of the hall. The small, roofless building in the foreground, contains a number of bee boles in its South Eastern external wall. The West wing of the hall, contains the chapel, which was accessed through a wooden trap-door in the dairy passage. This small room still retains its wall paintings in ochre and black, depicting trees, animals and the ten commandments. The hall was originally called Cross Hall....a name it gained due to a preaching cross that was mounted in the South East angel of the courtyard. The earliest building here was the home to the Kirkby family....dating from sometime in the 12th century. It is unlikely that anything remains of the original buildings. The Kirkbys were an influential land owning family from the 12th century right through to the 18th century. John Kirkby (born around 1204) was a judge on the King's bench, as well as Baron of the Exchequer. Richard Kirkby (born 1624) was Governor of Chester Castle. The Kirkby family were also Sheriffs of Lancashire and Justices of the Peace. The family's downfall was as a result of their support for Charles I during the Civil War. It's unusual that they managed to retain most of their lands....especially when considering the example of the Phillipson family of Kendal who lost both property and personal possessions for their Royalist sympathies!! The hall finally passed from the Kirkby family in 1719, into the hands of the Cavendish family, who in turn held the hall until 1771. Not easily accessible, but can be viewed from nearby common land. 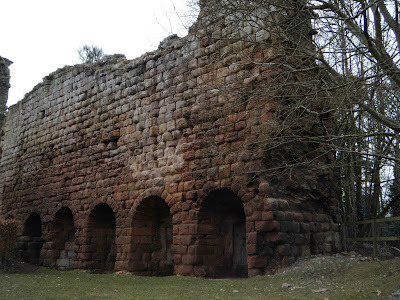 Laying some 18 miles to the North West of Carlisle, and situated a few yards off the A75, Annan possesses the earthwork remains of what was the original seat of the de Brus, or Bruce family. The badly eroded motte and bailey castle is situated just off the aptly named Bruce Street, on the East banks of the River Annan, and is, sorry to say, a shadow of its former royal self. The River Annan has completely removed the Western half of the motte, turning it into a narrow ridge....much the same as at Tebay. The photo above, shows the motte looking North. The river is on the left of the photo. The ditch surrounding the motte can still be seen. 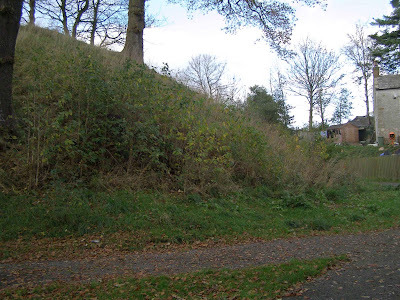 The motte now stands to around fifty feet high, and, due to the damage caused by the River Annan over the years, the once round motte, is now around fifty feet by twenty feet at the summit. A broad ditch that separated the motte from the bailey, can still be seen, stretching some 270 feet to the South, and about three feet deep. The motte and the bailey were also probably surrounded by a deep ditch, but these have long since been destroyed by the river, and a certain amount of landscaping that has taken place here. 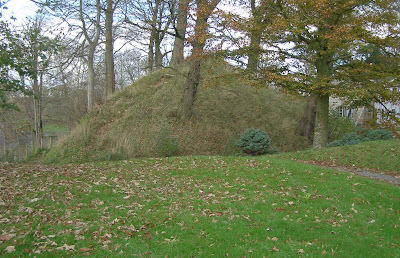 The photo above, shows the base of the motte looking North, from within the ditch. The castle is believed to have been built during the early 12th century, by the de Brus (Bruce) family. 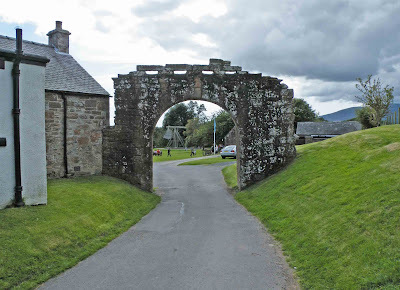 It seems that it was occupied for a very short period of time, as by 1166 it is thought to have been abandoned in favour of more comfortable and dry accommodation at Lochmaben Old Castle. Because of Annan's connection with the Royal Bruce's, the town became a Royal Burgh, and as a result of its importance, and its position so close to the border with England....especially being only 18 miles from Carlisle, it was frequently attacked, occupied and used by the English in their campaigns against the Scots. After the motte was abandoned, it seems that the church became the strongest and most defensible building in Annan, being used by Edward I in 1299, for safely and securely storing arms and supplies. The church was destroyed in 1547 by Henry VIII's army, forcing the towns folk to build a new fortified tower, surrounded by ditches and wooden palisades. This fortification was built by Lord Herries in the early 1560's, and was reputedly large enough to hold a garrison of one hundred men with fifty horses. It was destroyed in an English attack in 1570, but rebuilt again in 1579 by Lord Maxwell. Unfortunately nothing now remains of this later fortification. The motte and its grounds are open during daylight hours. Many thanks to Neil MacInnes for the photos. These illusive remains are to be found perched precariously at the summit of Eller How, high above the A590, some six miles West of Levens. The larger area is known as Newton Fell...an area of South Lakeland that gives its name to two hamlets less than a mile apart...High and Low Newton. The heights are also known as Dixon Heights, with a right of way passing a few yards to the West of the tower's now sorry remains. 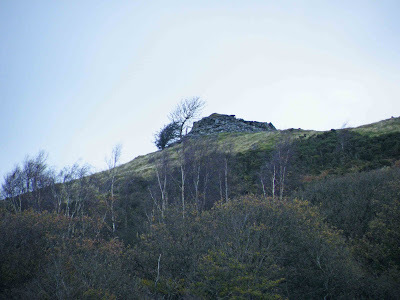 According to the Cumbria Action Group, the ruins can be attributed to George Webster of Kendal, the town's famous architect and marble cutter, who owned land at Eller How a few hundred feet below Dixon Heights. He built the house at Eller How in 1827, so it's likely that the folly was built soon after this, probably as a summer house or a 'quiet' retreat. From here, the Webster family would have had excellent and unspoilt views across to Witherslack to the North East, Grange to the South and Hampsfell to the South West. The ruins are not linked in any historical way to the area a few hundred yards to the North, shown on maps dated 1851, as The Old Castle, but it may have been on George's mind to build the folly here, on or near the site of the Old Castle....whatever that name may have once applied to. Interestingly....also shown on this map, to the North of the Summer House, there is another site, clearly labelled as Tower. Obviously some more research of this whole area is needed, including a field visit....to take some more photos and to take a good look at the remains of the tower. Philip Davis rejects this as a fortification, and I wholeheartedly agree with him. All documentation (what little there is) point to these ruins being the remains of a summer house or folly. The area to the North of the tower (Dixon Heights) is still called the Bishop's Tithe Allotments on ordnance survey maps. More research is needed to find out what this area referred to, although my best guess is that it was connected with nearby Cartmel Priory in some way....possibly Furness abbey even!! I think the next step is to visit the ruins here at High Newton, and to confirm the type of building that can just be seen from the nearby main road. There are a couple of photos of the ruins here....but they don't really tell us much. 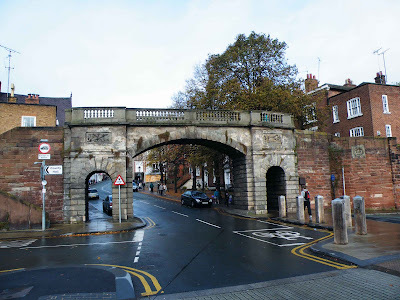 The last of the gates at Chester that was missing from my collection, Bridgegate, is situated at the Southern end of the city, at the end of Lower Bridge Street. The road here leads straight onto the old medieval Handbridge over the River Dee. Designed by Joseph Turner, and opened in 1782, the Bridgegate replaced a long line of gatehouses and buildings on this site. It is thought that the original, defensive gatehouse on or very near to this site, was already in existence by the 1120's, as the post of Office Sergeant was recorded at this time. It was, at this time, known as the Welshgate, as all traffic from Wales had to pass through this gate to enter the city. 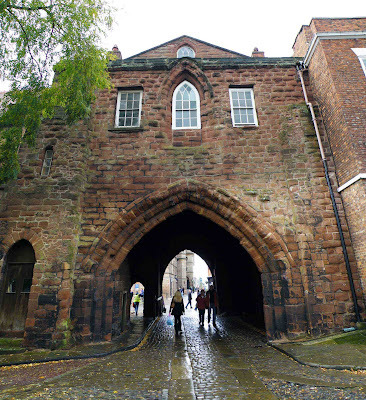 The gatehouse, in whatever form it took, was replaced or rebuilt in the 14th century, at the same time that the bridge was rebuilt, to enable traders to enter the city. By the end of the 15th century, the gate consisted of a single Gothic arch with a tower at each side. In 1600, a square tower was added, called John Tyrer's Water Tower, which housed machinery for taking water from the River Dee and lifting it into the city. This building was destroyed when Parliamentarian forces laid siege to the city. 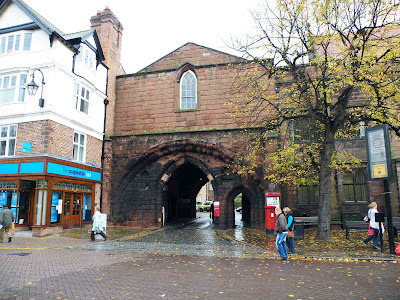 The present gate way, is similar to the other 18th and 19th century gates into the city of Chester. 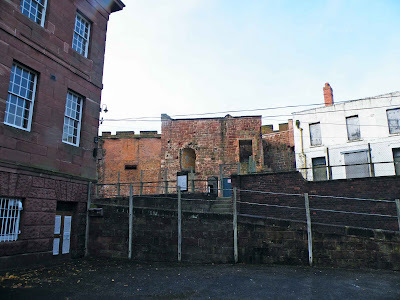 I've at last managed to bag some photos of the last parts of Chester's fortifications that I wasn't able to photograph on my visit to Chester in 2008. 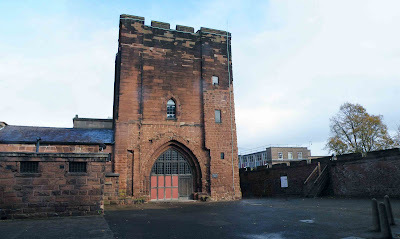 These last three sets of photos are of the Agricola Tower at Chester Castle, shown below, the Cathedral gatehouse and the Bridge Gate. The Agricola Tower lays at the Eastern side of the castle. The inner ward, to the South East and West of the tower is still walled, but these walls were mostly rebuilt and\or refaced during the 18th and 19th centuries. There were originally three towers built within the inner ward, overlooking the wall...but these have long since been demolished. These three square towers would have been accompanied by a round bastion and a twin towered gatehouse. The Agricola tower is the sole surviving tower here, measuring some nine metres square and three storeys tall. It is thought that the huge archway in the South West face of the tower, shown above, was once either the inner arch of a former gatehouse, or the chancel arch of a chapel. The chapel would have been housed within the tower, whilst the nave would have possibly been a timber framed building, extending to the South West. The tower may have been built sometime during the 12th century, judging by the 'clasping' buttresses, but on the whole the tower has a 13th or 14th century look about it. The tower contains a rib vaulted floor to the first floor, probably inserted after a fire in 1302 seriously damaged the building. The southern buttress contains a spiral staircase providing access to the other floors within the tower. The middle storey contains the chapel of St Mary de Castro with an altar recess built into the North East wall. The halls and chambers shown on early maps and plans of the Inner ward have all been demolished and replaced with other buildings. Wall paintings were discovered in the chapel, possibly dating from the 1220's, when the white washed walls were 're-decorated' in the 1980s....demonstrating the age of the tower. These days, the tower appears to be out of bounds. One of the gentlemen manning the gates told me that the inner ward area of the castle had become a haunt for local drug users and homeless people, and was therefore kept locked and inaccessible. He was kind enough to give me five minutes to take some photos to add the collection though. The tower is only just visible from the river side, and only if the trees are not in full leaf....from other angles it is all but invisible...so these are welcome additions to the Chester collection. Lawkland Hall was a revelation...I had no idea such a huge and beautiful country house was hidden away so close to Settle. This is a Grade I listed building, and although the photos here don't really do it justice, the grading is well deserved. Lawkland is a loose collection of houses and farms situated on Graystonber Lane....an old road that pre-dates the A65, running from the South of Austwick into Giggleswick some eight miles to the South East. The hall possesses huge ornamental gardens, set about the grounds to the rear (South) of the property. Above. Detail of an old postcard showing the front facade of the hall close up. The above photo shows a view of the hall from the road, looking directly South. There is a central hall block, with two towers either side. The left one can be seen in this photo, and the right hand one can be seen in the last photo on this posting. The tower shown above, and the central hall block, are thought to date from the late 16th or early 17th century, indeed there is a date stone in the hall showing a date of 1679. Check the link out for a photo. The hall and the early tower, were built by Peter York of Middlesmoor. He was the Governor of Lieth in Scotland during the reign of Edward VI (reigned 1547 to 1553) Peter York married the daughter of Sir William Ingleby of Ripley Castle....and the manor of Lawkland and its associated lands were eventually sold to John Ingleby of Ripley. This is thought to have taken place some time around 1572, at which time it is thought there was probably a hall house of some description here at Lawkland. Whether there was a defensive tower on the site isn't known. The Ingleby family gradually began to buy up land and properties in the surrounding villages, adding land in Clapham to their property portfolio, including the manor house at Clapdale, described as "a great old castle joyning on Clapham ". This building....castle or not....features heavily in local history and legend. 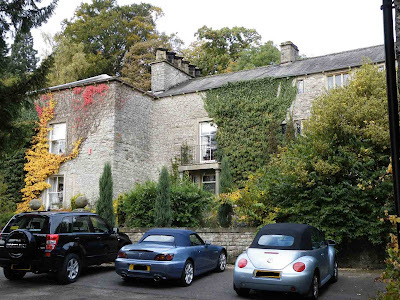 The Ingleby family are also connected with Austwick Hall, reputedly using this property as the manorial centre for Austwick and the surrounding farm lands. The Ingleby family were of the Catholic faith and so kept a low profile...possibly the reason that there is so little information regarding the family. 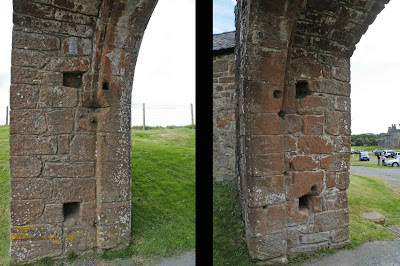 The hall at Lawkland is alleged to have a priest hole, hidden within the line of chimneys visible on the last photo of this post. 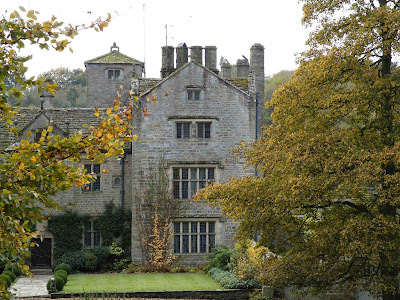 By the mid 1600's, the Ingleby family were spread across three manor houses....at Austwick, at Lawkland and at Clapdale Castle. Some research needs to be done on where Clapdale Castle was....and if there are any remains left. 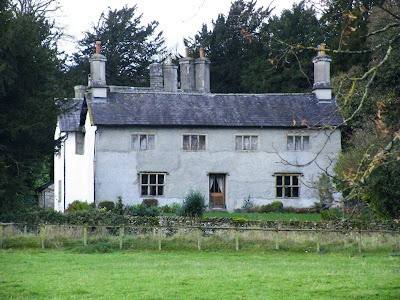 The hall at Lawkland was rebuilt in 1679....the works being described as a "thorough rebuilding" so it's safe to assume that many changes were wrought on the fabric of the hall. At this time, continuing through the 1700's, the hall became the centre for Catholic worship, providing a safe haven for 'Papist's' especially with the construction of a second floor chapel. The Inglebys continued to own the hall right throughout the 1700's, rebuilding and adding onto the hall and providing us with the 'mish-mash' of building stlyes that we see today. In 1846, the Ingleby family relinquished their hold over Lawkland Hall, with the death of Margaret Ingleby. 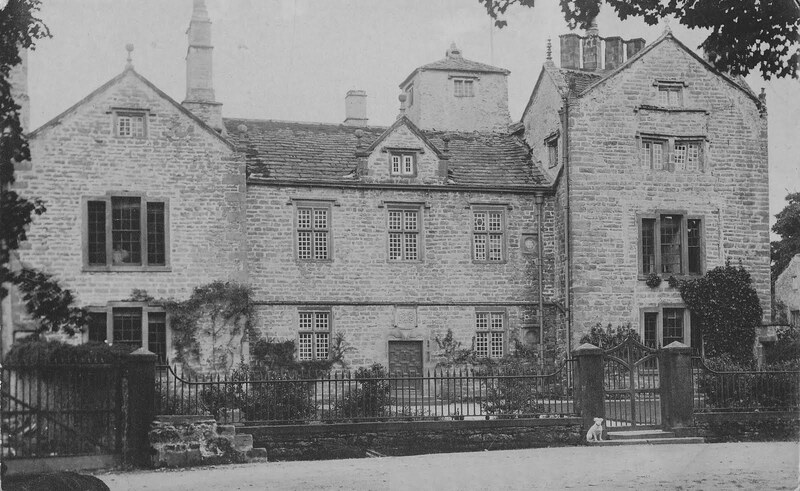 The Fosters occupied the hall from this point on, until it passed to the Watkins, possibly after the death of John William Foster. In 1914, the hall passed into the hands of John Ambler, a cloth manufacturer from Bradford. In 1937, the Amblers rented the hall to James Southworth who bought the hall and the surrounding lands in 1939 for £8500. His money brought him Lawkland Hall, Lawkland Hall Farm (a few hundred yards up the road)and Lawkland Green which consisted of 225 acres. 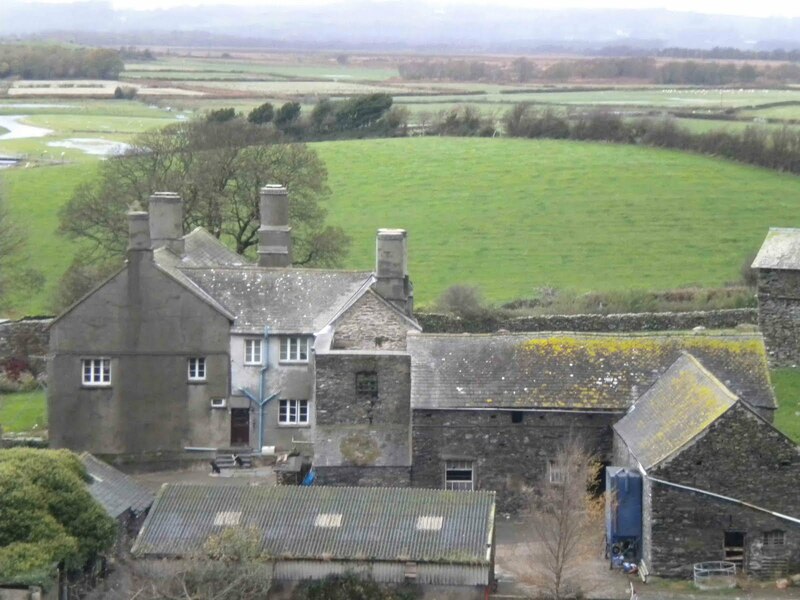 By the 1950's the hall had once again been sold, this time to the Bowring family, who still reside at the hall. Whether the hall contains the remains of some sort of light fortification, or is built on the site of an earlier fortified building is extremely difficult to tell....the building is of so many different periods, each with their own characteristics that it is almost impossible to pick through the melee of towers and wings. If any further information comes to light regarding Lawkland Hall's possible fortified history, it will be posted here. The very picturesque castle at Stokesay lays in the village of Craven Arms, on the A49 11 miles to the North of Ludlow, and about 15 miles South of Church Stretton in Shropshire. The castle consists of a large tower at the North of the site, with a projecting central section and timber built gallery, a large banqueting hall built along the Western side of the castle's wall, a Tower built at the Southern end of the West wall, an open courtyard, a now dry moat and a fine, well preserved gatehouse, timber built and not of any great defensive qualities. 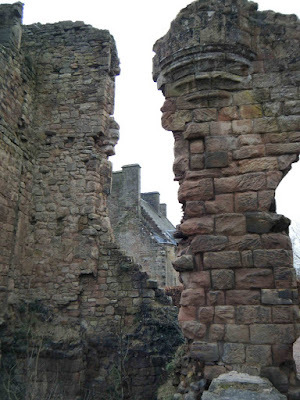 The above photo, shows the Great Hall\banqueting hall from outside the castle's walls. The hall is around fifty feet long, and sits between the castle's two towers. The hall possesses an unusual open fire hearth in the centre of the huge room, instead of the normal fire place in the wall. It seems that there was never a vent in the castle's roof for the smoke to disperse through...the blackened roof timbers bear witness to this. A small part of the hall, at the South end, by Lawrence de Ludlow, as a private 'withdrawing chamber' with squints in the walls through which he could spy on his guests. The photo above, shows the North tower with it's well preserved timber gallery. The tower possibly dates from the 1140's, making it most likely the oldest structure surviving today. The five sided tower overlooks the yard of the church of St John the Baptist...the moat can just be seen, laying beyond the fence posts. These days the moat has been infilled, and serves as a walk around the outside of the castle walls. The photo above, shows the castle viewed from the East. The South tower can be seen to the left of the photo, and the gatehouse can be seen in the foreground to the right. The North tower can just be seen to the right of the gate house. The South tower, probably dating from 1291, was built by Lawrence de Ludlow, and was erected after he gained a license to crenellate on October the 19th, 1291. The exact wording of the licence is: "to strengthen with a wall of lime and stone, and crenellate his mansion [mansum] at Stoke-say". (thanks to Philip Davis) The tower represents the heaviest defences here at Stokesay, with its thick walls and multi faceted exterior....affording the occupiers of the castle good views to the South West, the South and the South East. 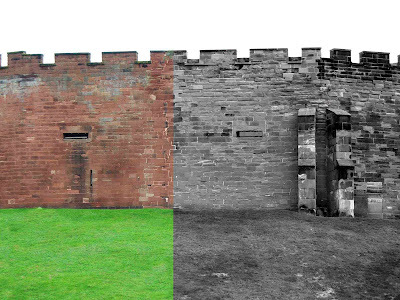 The curtain wall was built as a result of the license, but only one portion still stands to the original height, between the South tower and the Great Hall. The rest of the wall has been much reduced in height, and now resembles a simple field wall. The gatehouse, along with the jettied portion of the North Tower, is one of the most recognisable features of Stokesay Castle, with its yellow plaster work and dark timbers. As far as defensible\impregnable gatehouses go, this 16th century building would not stand up to any form of attack....so it's most likely that it was built as a status symbol\prestige building by the then owners, the Baldwyn family. It's thought that this building replaced an earlier, possibly more defensive gatehouse. The Baldwyn's were in possession of Stokesay castle during the Civil war, and in 1645, when nearby Shrewsbury fell to Cromwell's Parliamentarian forces, the defenders at Stokesay didn't take long to decide to surrender to his forces after a very short siege. The order was given for the castle to be slighted...but the orders were only carried out on the curtain wall, which was reduced in height two years later. The castle remained inhabited for the rest of the 1600's, until it was finally deserted in around 1706. It was used by local farmers for storing grain for the next 150 years or so. Sometime in the early 19th century, the 13th century buildings were recognised for their architectural and historical importance. The castle was purchased by John Darby Allcroft in 1869, and he immediately set about restoring the buildings. 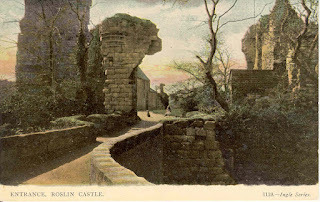 The castle was opened to the public by the Allcroft family in 1908, and ran it as a tourist attraction until 1992 when it passed into the care of English Heritage, who run the castle now. 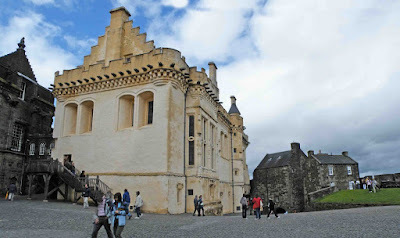 The following link takes you to some fantastic photos of the castle. The following link takes you to an excellent plan of the castle. 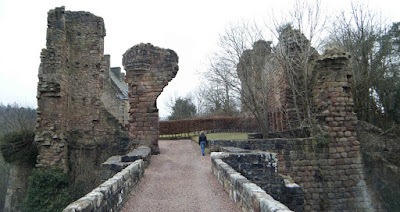 I forgot that I had photos of the gatehouse at Caerlaverock castle....so here they are. The remains of the North East entrance fortification can be found at the head of a rectangular courtyard, surrounded by the remains of ditches and banks...now much worn. 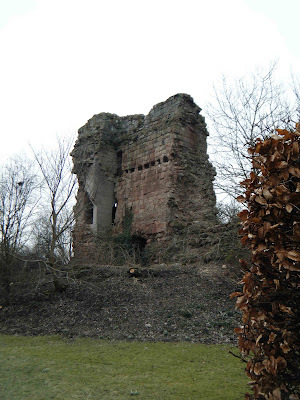 The photo below, appears to show machicolations at the top of the gatehouse, although it's likely that the remains only represent a tiny portion of the original building. The walls are probably around four foot thick, and as shown in the photo below, contain two large draw bar tunnels. I wonder if there would have been a smaller door, set within the main door....if you look at the top larger draw bar tunnel....there is a smaller one, possibly for allowing visitors on foot, entrance to the courtyard. A single hinge now survives, still embedded within the stone work. 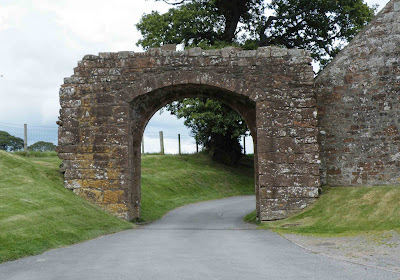 Any sources I checked when researching these remains, neglected to date the gatehouse....though when I visited back in August, the greeter at the castle stated that he thought the gatehouse probably dates from the 17th century. Excavations in 2000, uncovered the footings of a large number of buildings with cobbled pathways between them. The lack of any roof tiles or roof materials, seems to suggest that these cobbled enclosures may have been for safe-guarding life stock. 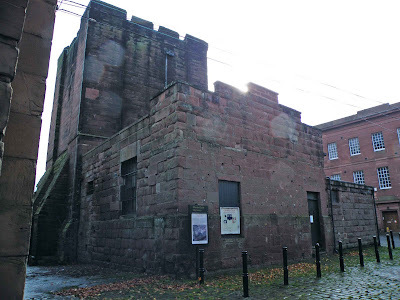 The bank was found to have red sandstone footings on its top surface, indicating that it would one have been substantially higher than it is today. The gatehouse doesn't get much attention from visitors, and it's fairly difficult to find any information regarding its builder or any information that would enable me to date it. This very well hidden tower house sits at the head of Loch Beag, about five miles East of the Northern tip of the isle of Jura. Built on private land, and hidden from prying eyes by a screen of trees from the loch, it would appear that this is a very difficult tower to photograph properly. Craignish Castle was originally the home of the Campbell's of Craignish, and for many years was also the home to the Lairds of Craignish. 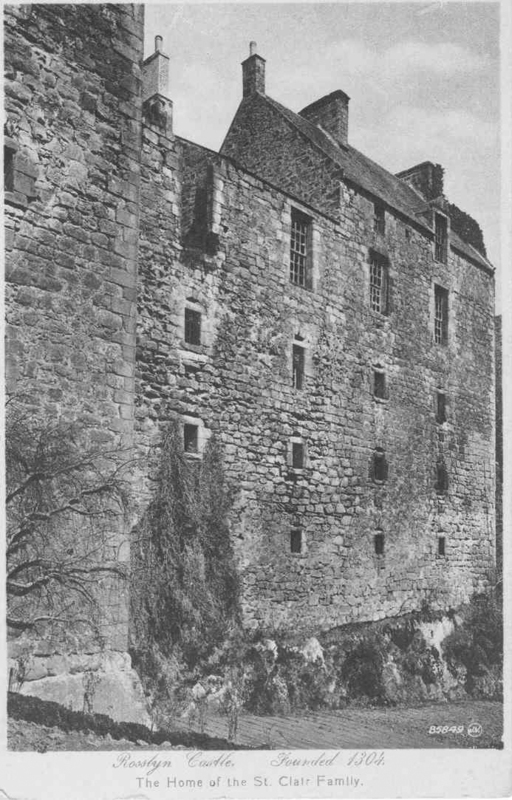 Dugall Maul Campbell, was the first Laird, and it was his descendants that built the castle here. During the early 1500's, the castle was in the hands of Ranald MacCallum....the hereditary keeper of the castle. The site is thought to have been home to a castle from as early as the 12th century, but the castle seen here today probably only dates from sometime during the 16th century. It started out as a simple keep, measuring some 50 by 32 feet over walls nearly seven and a half feet thick. The tower has since been absorbed into a modern mansion house, built sometime around 1832. It is built on a rocky outcrop, possesses a vaulted ground floor and has a dungeon, hewn from the bedrock beneath it. This link shows a great photo of the mansion with the tower house built into it. 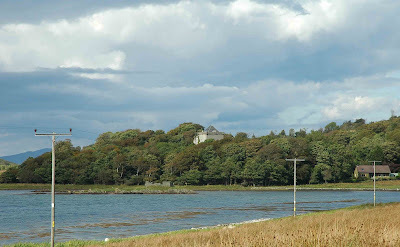 These days, the closest you can get to see the castle, seems to be from the waters of the loch. Apparently Rosslyn Castle is a bit of a secret as far as castles go. 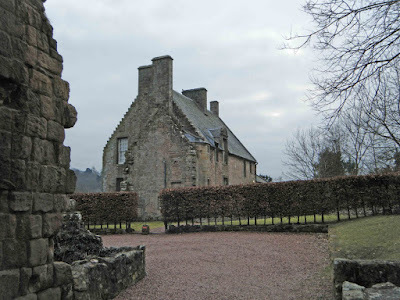 Its nearby neighbour, the world famous Rosslyn Chapel (the Da Vinci Code etc) is visited by thousands of visitors each year, but the castle is a relative secret, even though it is only about five hundred yards to the South East. 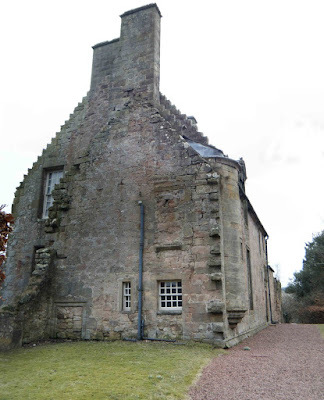 The village of Roslin is about nine miles South of Edinburgh, and both chapel and castle lay on a high ridge above the River North Esk in the Roslin Glen Country Park. 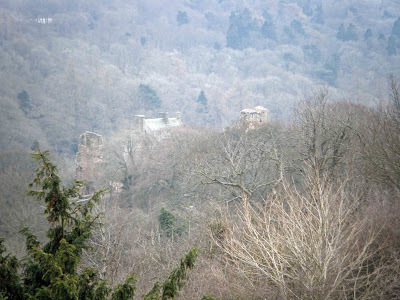 The castle is accessed via footpaths and tracks that lead from Rosslyn Chapel, or from the car park in Roslin Glen. It is probably the relative inaccessible nature of the location, that prompted its builders, the St Clair family, to choose this spot to erect their castle. Above. A view of the Sinclair house. Above. A view across the bridge and into the courtyard. This final attack signalled the end of the castle as a fortification, but not a home. The St Clair family built themselves a grand house within the confines of the old castle. This was the target of rioters from Edinburgh in 1688, who were on a rampage against all ‘Popish’ targets. The house repaired after this attack and the family continued living there. Above. The Sinclair house glimpsed through the remains of the gatehouse. The layout of the castle, includes a central courtyard, with a range of building built against the Northern most wall of the castle. Above. Another view of the Sinclair house across the courtyard. A heavily buttressed wall stands at the cliff edge, against which, at the Southern most end a keep was built (now in ruins) A significant range of buildings were built against the Eastern side of the castle’s walls, and most still stand to some degree or other. Above. A portion of surviving wall in the courtyard. Above. Vaulted chambers in the courtyard wall. Above. A view towards the gatehouse ruins. Above. The castle as it appears from the walls of the chapel. Above. Floor plan of the buildings that make up Roslin Castle. Above. Cut away plan of the castle. The house that the St Clair family built after the castle’s near total destruction in 1651, is now available for holiday lets, but the castle grounds are freely accessible. If you visit the chapel it's well worth also taking the walk to the castle.....which is only about five minutes down the hill. If the weather is fine and the ground dry, I would also recommend walking down to the river side, as there are fantastic views of the exterior of the castle walls from here. Stirling Castle is really one of those magnificent sites that demands two write ups: a historical over view, and a site over view. I'll start with a historical over view, detailing the castle's many building phases and surviving (and missing) structure later on in the blog! To start with, the location of this castle is perfect...for both defence, and for the choosy castle hunter looking for a great site to photograph. The River Forth and the River Teith merge just to the West of Stirling. The River Forth then snakes its way from West to East, meandering along the bottom of the valley. The river in its self has always been a barrier across which anyone needing or wanting to travel into Northern Scotland has had to cross. As well as the river, to the North and North East, the Ochil Hills rise to a height of 721 metres (Ben Cleuch) providing an almost impenetrable barrier.....whilst to the South and South West, the Touch Hills rise to an equally impressive 521 metres (Miekle Bin) In effect, these two ranges of mountains, with the valley and its ever present castle beneath them, have almost cut Scotland in half, both geographically and politically for as long as Scotland has been a kingdom. 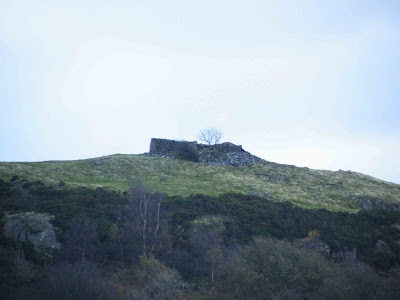 It is surmised that the huge volcanic outcrop upon which Stirling castle is built, would, at one time, have been occupied by the Romans, the Votodani or the Picts, purely on the basis that this piece of high ground over looking the river, would have been of valuable military importance to any one needing to occupy this part of Scotland. There is evidence for a small fort on a rocky outcrop to the North East of the castle, on a hall called Gowan Hill. 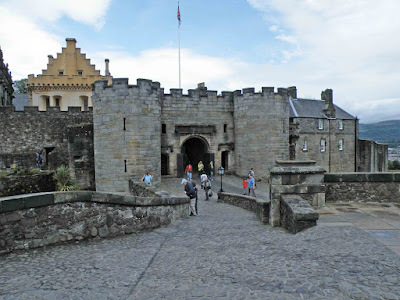 No evidence has been found of early occupation on the site of Stirling Castle though....perhaps the building of the castle in the early 1100's obliterated any signs of early occupation. The first record of a building of any sorts here, dates from 1110, when King Alexander I built a chapel in Stirling, probably on the castle's mount. With the death of Alexander in 1124, and the succession of King David I Stirling found itself as a Royal Burgh. The castle became the centre of local administration, probably extending its administrative and military control over the whole of the kingdom, until it was forfeited by King William I, under terms of the Treaty of Falaise, the English King, Henry II. 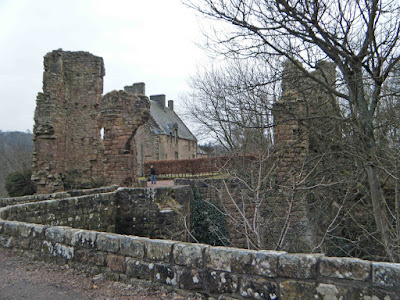 It is thought that the castle was not garrisoned by English soldiers during this period, and it was returned back into Scottish hands when Richard I (Richard the Lionheart) effective 'sold' the South of Scotland back to the Scots to raise money for a Crusade to the Holy Lands. 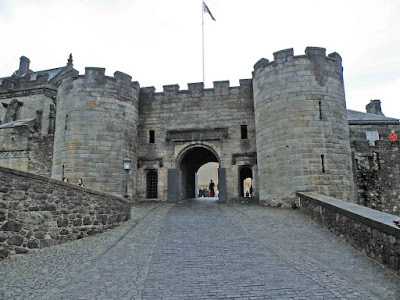 Stirling and its castle were favoured by Alexander III up until his death in 1286. The period of his reign is widely regarded as a golden era for Scotland, figuring heavily in European arts and politics, and becoming a strong independent kingdom. When he died however, there were no immediate heirs, and with the assistance of England's Edward I, the country was plunged into a succession crisis. Edward used this period of unrest to fuel divisions within Scotland, arbitrating between the rival factions with the sole aim of installing a 'puppet' king on the throne of Scotland. Edward demanded that all Scottish castles be placed under English control, including the Royal castle of Stirling....and with this in mind, he came North to take over Stirling in 1291. Edward judged that John Balliol had the strongest claim to the Scottish throne, and he was crowned at Scone on the 30th of November 1292. It appears that Edward's idea of a 'puppet' king backfired, as King John eventually chose to stand against Edward, effectively kick starting the 60 years Scottish Wars of Independence. In 1296, recognising both the military and symbolic importance of Stirling and its castle, Edward invaded Scotland. He found the castle empty and abandoned and immediately set about occupying it. In 1297 however, the thorn in Edward's side, William Wallace and an accomplice, Sir Andrew Murray defeated the English garrison at the battle of Stirling Bridge. It is thought that William and Andrew meted out a devastating defeat to the 9000 to 12000 strong English army, with as little as 2500 men....bottle necking the English army as it attempted to cross Stirling Bridge and slaughtering all who attempted to cross. The rest of the English garrison retired to the castle, where they were besieged for a short while before surrendering. The castle only remained under Scottish control for about a year. It was abandoned by the Scots after they were defeated by the English at the battle of Falkirk in July 1298. Edward, in turn, only held the castle for a year, when it was besieged by Robert the Bruce in 1299. The garrison did not receive promised reinforcements and were forced to surrender to the Scottish forces. In 1303, the English invasion and occupation of Scotland were gaining momentum, and with Stirling castle the only Scottish castle still occupied by Scottish forces, Edward laid siege to it....this time employing a new siege weapon, the Warwolf, a huge trebuchet that could be used to demolish castle walls. The very sight of the Warwolf is said to have intimidated the Scottish garrison into surrendering before it had even been used. 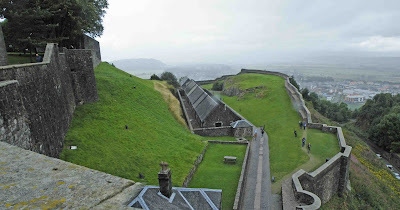 The English ordered part of the Scottish garrison back into Stirling castle so that Edward could see his new weapon used in anger. 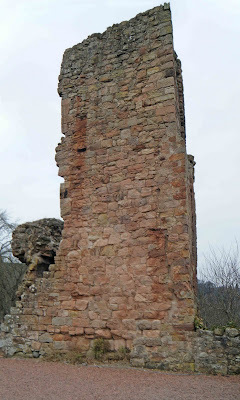 (A scale mock up of the Warwolf can be seen at Caerlaverlock Castle) It is thought that the gatehouse was destroyed as a result of this onslaught. Four years later, Edward I was dead, and it seemed that the English occupation of Scotland was beginning to crumble. Robert the Bruce was now Robert I of Scotland, and Edward's successor, his fourth son Edward (II) lacked the motivation and ability to maintain English rule in Scotland, especially against an ever strengthening Scottish uprising. By 1313, only three Scottish castles were still being held by the English. 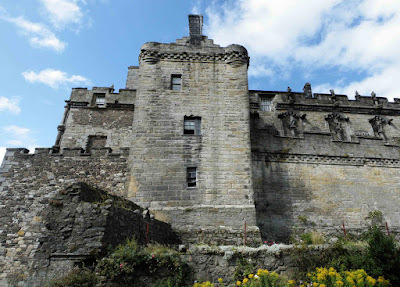 Stirling was one of these castles, and it was besieged by King Robert's brother Edward Bruce. 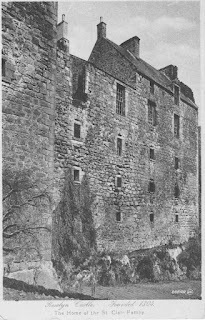 Realising the severity of the situation, the garrison's commander, Sir Philip Mowbray agreed that if he did not receive English reinforcements by the 24th of June 1314, he would surrender the castle to the Scots. Edward Bruce agreed to these terms and withdrew the seige. Edward II set out with an army of around 25000 men, with the intention of relieving the garrison in Stirling castle. On the 23rd of June, he was met by Edward's army (totalling some 9000 men) at Bannockburn to the South East of the castle. Over the course of the 23rd and the 24th of June, the Scots systematically slaughtered the English army, causing the death of an estimated 11000 English soldiers, and causing Edward II to seek refuge in Stirling castle. However, Sir Philip Mowbray decided that he had to keep to the terms of his agreement with Edward Bruce, and he duly left the castle to the Scots, forcing Edward and his surviving soldiers to flee. Edward and his personal bodyguard left and made their way to Dunbar Castle in East Lothian, where he then sailed back to the safety of England. Those English soldiers that tried to make their way back South to England on foot, were harried and chased down by the Scots, and slaughtered in their hundreds. Not only was Bannockburn a decisive defeat for the English, but it was relatively bad news for Stirling Castle. King Robert ordered that the castle be slighted....to prevent it being used by the English again should they make moves North again.